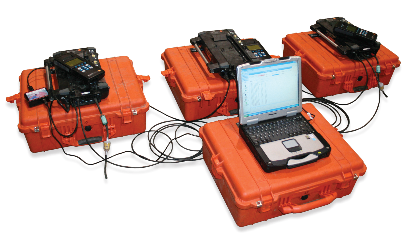 Multi-Stream Combustion Analyzers Alpha Industries Ltd.Alpha Industries Ltd. The MSCA analyzes up to fourteen flue gas streams simultaneously. This approach reduces the test duration by a factor of fourteen. Further, the MSCA instrument maintains its accuracy, so no pre and post test calibration is required. In addition the data is recorded in real time using a laptop computer, and custom software translates the data into results within a few minutes of completion of the test. This short duration helps to better ensure all data and results are representative of the boilers firing conditions without the influence of slagging and fouling on emissions such as NOx. The MSCA will allow the real time monitoring of a ducts emissions while a plant representative makes operating changes, such as burner air register settings. Hence the impact of only one burner air register change can be visualized on the entire boiler within 30-5 minutes instead of hours with traditional sampling and analysis. The SAS MSCA allows our combustion optimization group to provide measureable savings in resources when compared with firms that use only the traditional sampling and analysis approach. 6 greater confidence in the data and results since operational variables (slagging and fouling) are reduced.